The Iranian Association at the University of Toronto (IAUT) is proud to host Dr. Mohammad Ali Eslami Nodushan, the renowned Iranian poet and literary scholar, from March 26th to April 6th . During his visit to Toronto from Tehran, Dr. Nodushan will offer an intensive look at Iranian studies in eight consecutive lectures at the University of Toronto, which will be delivered in Persian. He will also deliver one lecture in English. Born in the town of Nodushan in the province of Yazd in 1925,! Dr. Nodushan completed secondary school in his home town, took a law degree at the University of Tehran, and subsequently completed his doctorate in law in France. Upon returning to Iran, he began a long and productive university teaching career which traversed law and literary studies. Upon his retirement from full-time teaching, he founded the Ferdowsi Cultural Centre and the quarterly, Hasti (being) in 1993. Dr. Nodushan is the author of over 45 books about social, cultural, and literary issues. His writings cover a broad spectrum, including the issue of morality in literature. Among his works in Persian are Lest We Forget Iran, Human Rights Advocacy in the Developing World, Life and Death of Heroes in the .Shahnameh,. which has been used as a textbook for numerous university courses. He has lectured at over 40 universities in more than 20 countries, including Canada. The text of these lectures, delivered in English a! nd French, are being prepared for publication. 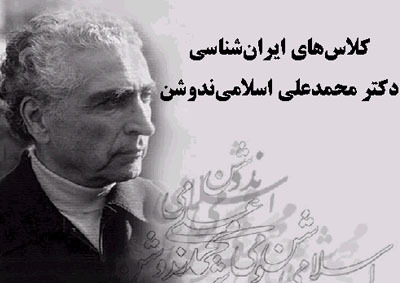 Dr. Nodushan is among the most lucid writers of Persian prose. The recent publication of his memoirs, entitled Days, has ushered in a novel style and, similarly, his travelogues have energized this genre in Persian. Among these are Safir-e Simorgh, which is an account of his travels to numerous countries and many cities in Iran. Liberty of the Statute is an account of his travels in the United States. Sun Mar 27 BA1210 Why is Iran a unique country? Mon Mar 28 BA1210 What is the Message of the Shahnameh for Iranians today? Tue Mar 29 BA1200 Why has Literauture Become the Gateway to Iranian History? Sat Apr 2  BA1210 What Message Can Iran Have for the World? Location of the lectures, is in the University of Toronto, Bahan Centre for Information Technology . 40 St. George Street. Ticket prices are $10.00 ($8.00 for members and students). For those who wish to attend all sessions, a pass will cost $50.00 ($45.00 for members and students). For those interested in attending all sessions, please contact IAUT to register before Thursday March 24th. Dr. Nodushan will deliver one lecture in English entitled, Some Characteristics of Iranian History. The time and location of this free lecture will be announced later.